legal responsibility for any injuries they might sustain)! 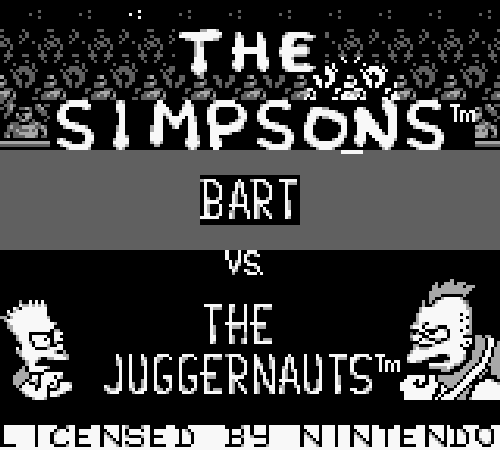 Let's see who today's contestant will be... Why, it's Bart Simpson! juggernauts and win a fantastic prize! 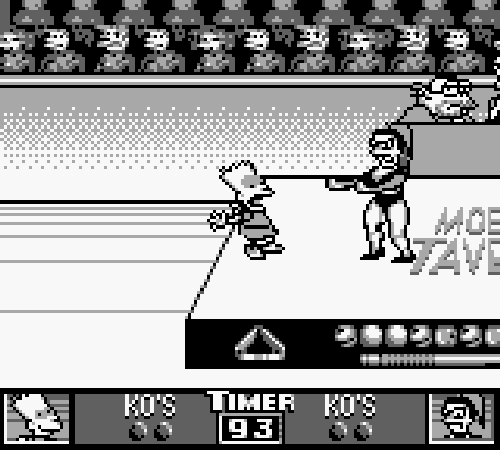 Press A at the start screen to begin the game. bonus event after weeks #1, #2, and #3. Balls....Number of balls you got into the basket. Rods.....Will electrify when floor is going to switch. shoot, press one space from the basket to dunk. sized floor, with each tile representing one space. over one space by holding A and then jumping. will switch the tiles. Keep that in mind. to get to the top and bottom. X = The tiles you can jump on to get across. BBB = The evil black tiles. Avoid with double jumps. Event Money: What you get for playing the event. Ball Bonus: You get a bonus for each ball you got in. Hits Bonus: You get a bonus for each hit you still have. Win Event Bonus: You get money if you keep at least one hit. Speed....Push A repeatedly to gain speed and fill the meter. A........Press repeatedly to speed up. Juggernaut arms (through the floor). to gain speed. You can check how fast you're going in the Speed meter. juggernaut hands that will appear in various spots. up or down to avoid obstacles in the other lane. actually reach the juggernaut and knock him off the platform. intended point of impact. Did ya get all that? No? Fine. You can fall short of the platform and fall into the abyss like a LOSER. keep you from losing a run and you can try the run again. then need to hold Up so that you actually go over the juggernaut. you haven't lost any runs already. juggernaut. It should add from $2000 to $3000 to the overall score. Runs Bonus: You get a bonus for each run you still have. Win Event Bonus: You get money if you pass the event. contact with skin! I say rubbish!" other with padded bats to knock the opponent off a platform. KO's....1 is added after every fall. Get 3 and you lose. Hits....Start with 5 hits, and you fall if you lose all 5. Hits regenerate every 3 seconds. Timer...Remaining time to get three KO's on the juggernaut. Right....Move to the right, jab with the bat, block. Up.......Take a high swing with the bat. Down.....Duck, take a low swing with the bat. A........Jump, hold Right and A to block. There are three positions on the platform: left, center, and right. fly out of the waste. avoid the hit, but you may also land right into a swing when you land. have to duck down while blocking. platform, so just don't stand there. 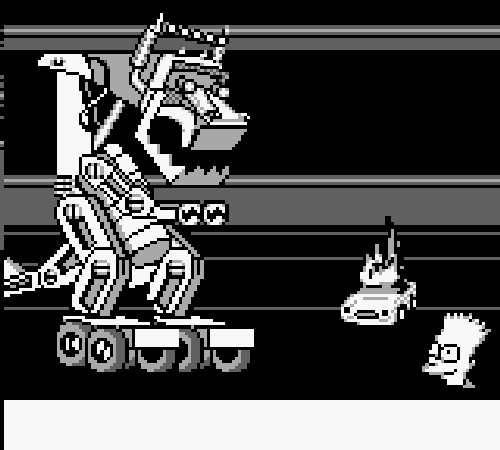 Oy, all these fancy moves. Jumping, high swings, ducking and blocking. keep jabbing forward with the bat. Now the juggernaut may get in a few shots, but don't worry about it. will be too quick to recover from. the juggernaut. They take two hits instead of the usual one. Time Bonus: Remaining time will be multiplied and added. KO's Bonus: The less KO's against you, the more money. 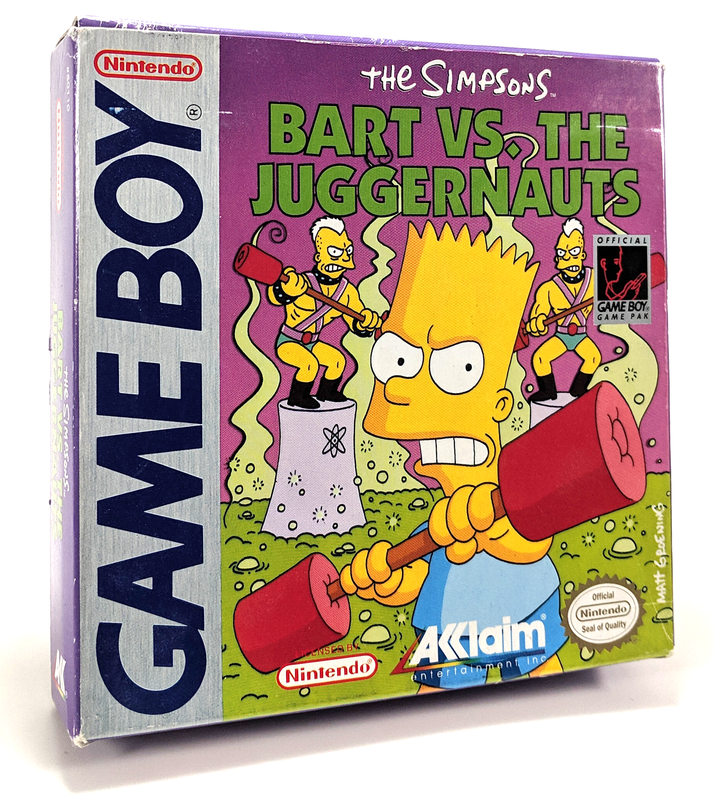 Barney Gumble, two of the fiercest shovers on Juggernauts! KO's....1 is added after every fall. Get 2 and you lose. Timer...Remaining time to get 2 KO's on the juggernaut. or Left to run and shove. and cause you to remain stunned for about three seconds. keep your opponents as close to the edge on their side as possible. You know how I mentioned that you can go near the bottom of the mat? Good, because that comes into play here. Barney out of the ring. There's this one cool move that works great... if you can pull it off. get close, and I mean CLOSE, then quickly press Up. the edge the toss will get you a straight KO. "Psst! Listen, kid: This info is top secret, you get me? Avoid the water balloons--they're strictly verboten! And don't loiter on the minefield!" balloons, then sprint across a minefield? Do ya, maggot?! Timer...Remaining time to complete the event. you. Lose 3 hits and you lose 1 run. too fast you'll hit the ground and lose a run. Crossing the minefield is easy to understand, and difficult to execute. The best thing to do is take your time and stay along the bottom paths. Don't stand still too long because the grenades home in on your position. Runs Bonus: Bonus money for each remaining run. Win Event Bonus: You get lots of cash if you pass the event. juice"--the fruitlicious fuel of champions!" poles as quickly as possible! Timer..............Remaining time in the event. Power..............Tracks the power for each hammer slam. direction to run at max speed. release at the right moment. near the bottom, so pay attention and run where you're needed. so there won't be any crazy last minute runs. little sissy man slams just won't cut it. hit that will keep the juggernauts at the top of the screen. usual and hit one of the poles. floor. 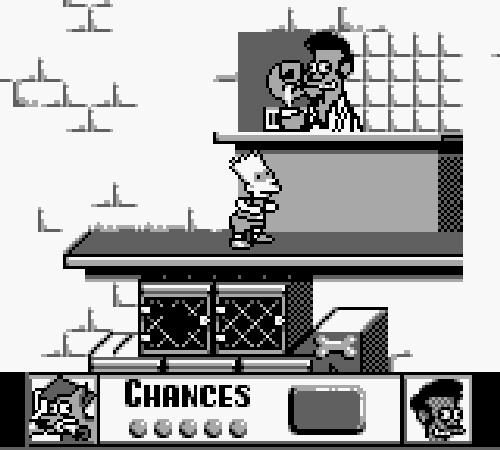 Bart has to get through the store to win this event. Chances....Remaining chances to beat the event. Item.......You can see what item you are currently holding. B............Press to use bones and sausages. correct path as each floor alternates from right to left. your winning of the event. off when the sausage is high. Chances Bonus: Chances are multiplied and added to the overall score. from above and let the lady catch 'em. Timer....Remaining time in the event (decreases each time). crucial part of the bonus event by the end. at the moment it is under you. angle drop, but only if you're desperate. Those tend to miss often. you try and drop another large weight on the right it doesn't stick. the left to even it out. You'll see what I mean when you get there. There, now the guide is completely complete. 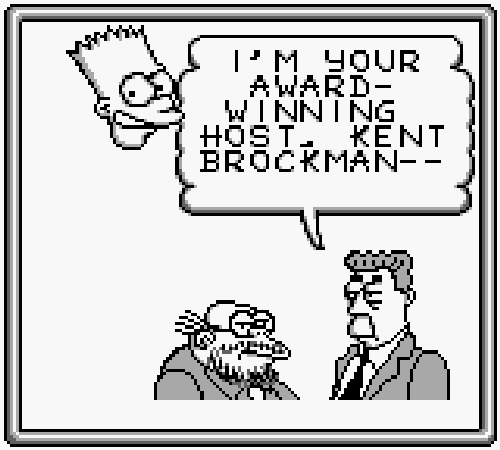 another notch on the ol' Simpsons game belt.